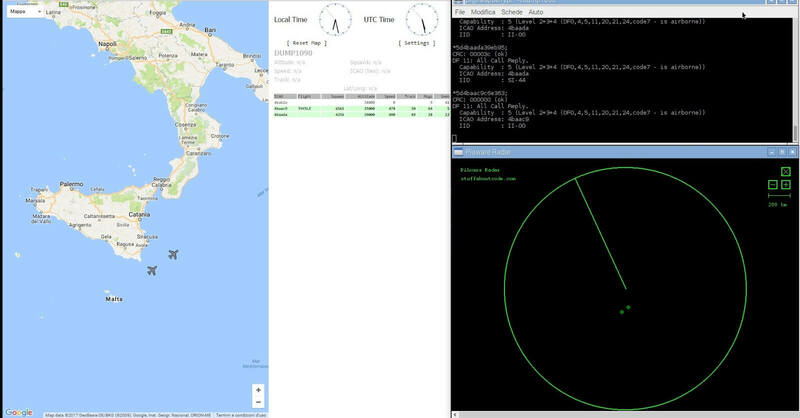 PiAware Radar is a Python script that connects to your PiAware server and uses the received ADS-B data to display a familiar radar-like display (green circle with rotating radius, and aircraft displayed as blips). 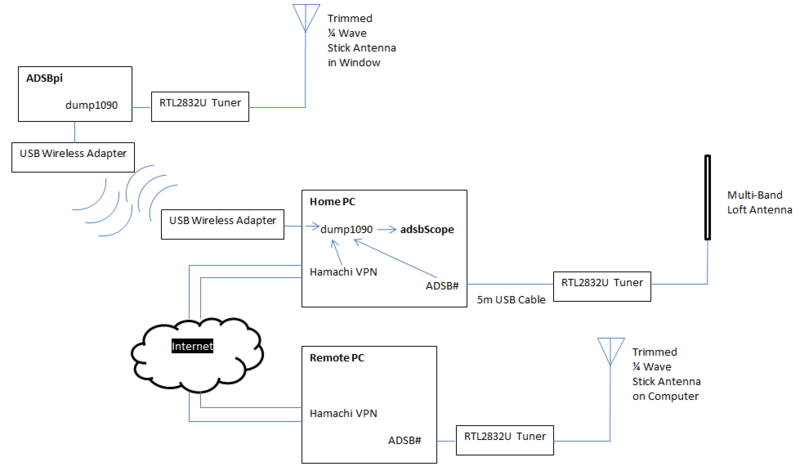 PiAware is the software used to take ADS-B data from an RTL-SDR dongle running on a Raspberry Pi and feed flightaware.com. A radar-like display is probably not very useful, but it could be used to set up an interesting display that might impress friends. 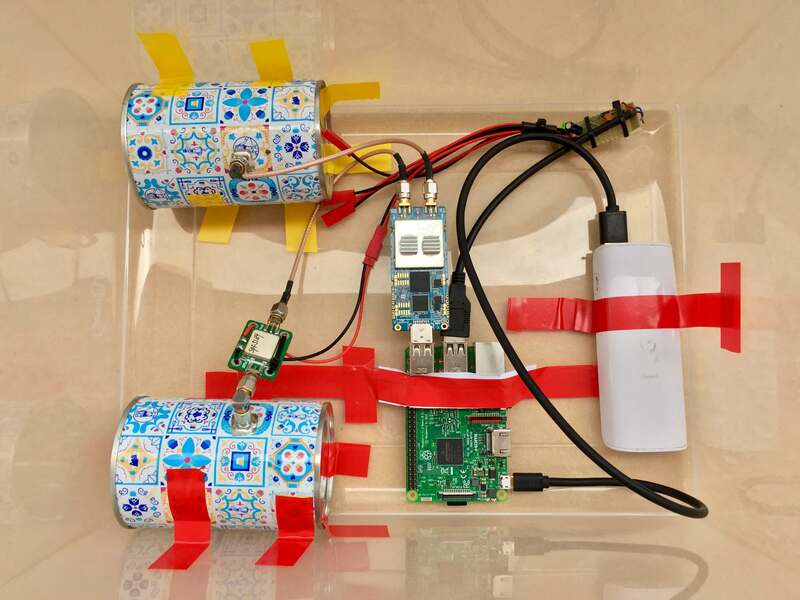 Over on his blog IT9YBG has uploaded a tutorial that shows how to set PiAware Radar up on a Raspberry Pi. Also on his blog IT9YBG has uploaded another tutorial that shows how to set up 1090XHSI, which is a program that displays an 737 aircraft cockpit simulation using live ADS-B data. 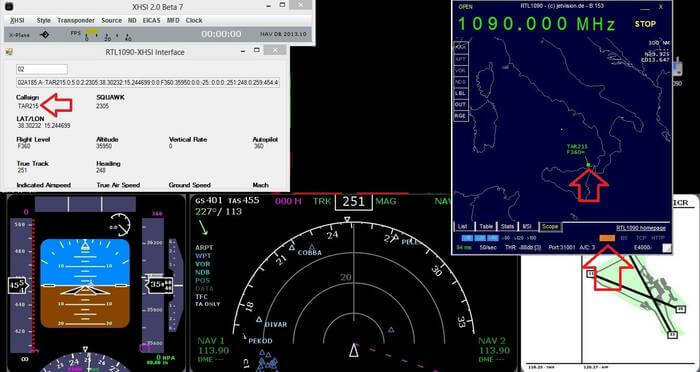 The ADS-B data updates the instrument displays in real time, giving you a view of exactly what the pilots might be seeing on their dashboard of their aircraft. We posted about this software in the past, but IT9YBG's tutorial helps make it much easier to set up. Receiving direct and (supposedly) reflected pulses from an L-band radar in Učka, HR (Lockheed Martin AN/FPS-117). The receiving station was 83 km away, with clear LOS. 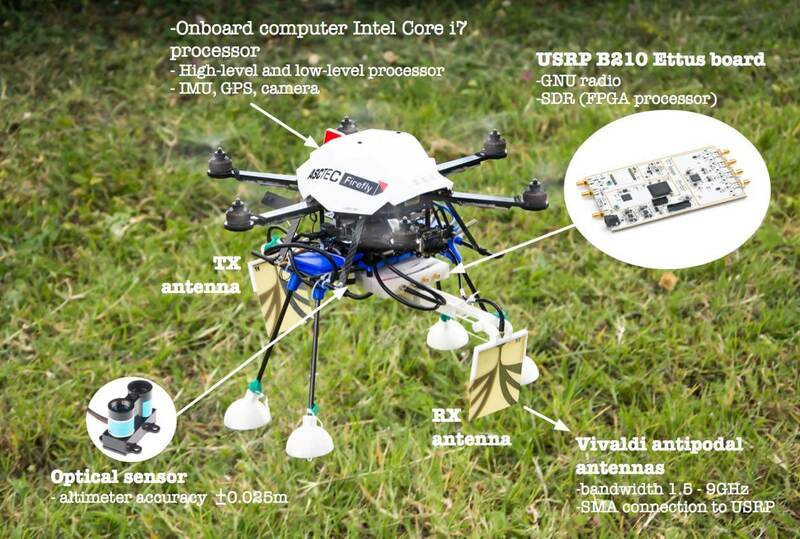 Center frequency is 1258 MHz (one out of four that this frequency-agile radar head is using). The receiver is a RTL-SDR dongle (R820T tuner IC) with a 2-dipole collinear array (tuned for 403 MHz) and approx 7 m of Belden 1694A RG-6 coax. rtl_fm output was piped to baudline, which is the software shown in the video. The IQ sampling rate is 2 MHz; the transform is a complex STFT (size=2048 samples, Blackman window). This is a 0.008x speed playback of 15 ms of recording. 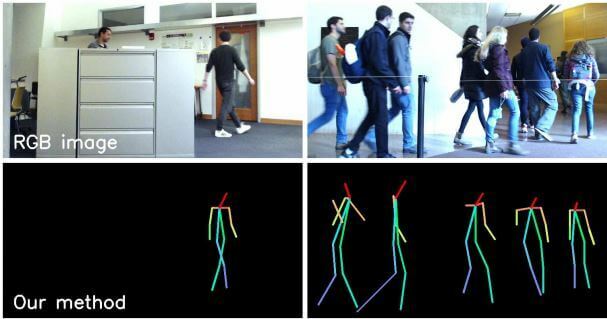 The direct-reflected delay is approx 278 µs (~42 km from receiver, in a simple 2D, along beam, normal incidence model). I should add that this “reflection delay” effect does not usually show up. Video recorded with VLC, audio piped to stdout and saved, then synced in Blender. 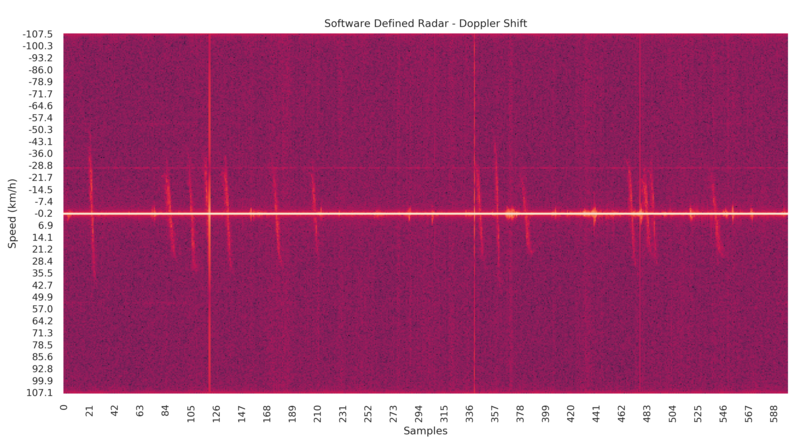 Analyzing radar pulses with Baudline and RTL-SDR. 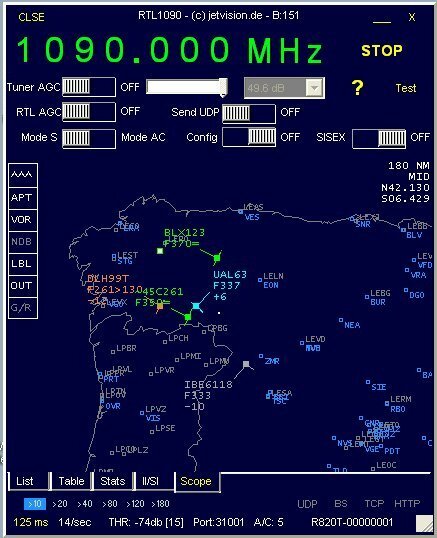 A (beta version) of an ADS-B decoder and display app for the RTL-SDR dongle for Android has been released. This app allows you to receive the ADS-B radio signals emitted by modern aircraft, which contain information such as flight number, latitude, longitude and altitude, essentially giving you a live portable aircraft radar. To use the app, you will need an Android device that supports USB OTG, which most Android devices on Android 4.0+ should support. You will also need a USB OTG cable, and an RTL-SDR dongle. You may want to consider a USB OTG cable that has a second port for external charging capabilities, as the RTL-SDR can drain the battery quickly. The app is cheaply priced at under $2, so give it a try! 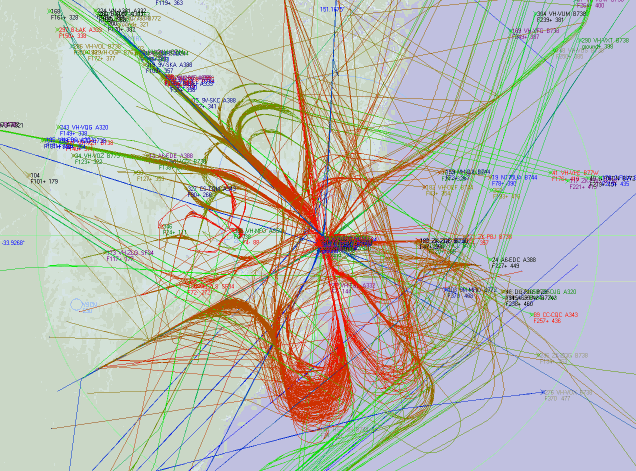 Over on Gough’s Tech Zone blog, Lui has posted a writeup about his experiences with combining multiple remote RTL-SDR ADS-B receivers to privately obtain ADS-B aircraft data from multiple antenna’s at multiple locations. His setup is shown in a diagram below. He has one remote antenna connected to a Raspberry Pi, one to a remote PC and one to his main PC. In order to do this he used the Linux based dump1090 ADSB-B decoder and hub software on his main PC. Lui was even able to compile and run the ADS-B hub portion of dump1090 on his Windows PC using Cygwin, but was unable to get the decoder part to work. It doesn’t matter though because the dump1090 hub can receive data from any ADSB decoder, such as ADSB#. His results look very promising as can be seen by the timelapse of plane traces in the image below. Lui also has some other interesting ADS-B + RTL-SDR posts that you should check out where he tests ADS-B reception with a Mini R820T dongle.